I am in the mood for a light lunch, something I crave when Summer is approaching. Nothing better than shopping for food in my refrigerator, there is always something light and filling to cook, or something raw to put together and I don’t mean cold cut meats. First I will prepare a veggie mixage, powerful, filling and healthy. I will make a large pot to keep for a few days. This is something to make into a warm soup one day and a power drink the next day. If you make a soup add either croutons, quinoa or pearled barley, olive oil, Parmigiano cheese is optional. If you make a veggie drink, spice it up with salt and pepper and drink it cold. I will put together carrots, red beets, celery, red cabbage, collard greens, broccoli and lemon grass in a pot half full of salted water. The salt will keep the greens very green. Boil until tender. With a boat motor crush all the ingredients until you have a smooth reddish velute’. Spoon this creamy mixture into a bowl or glass. 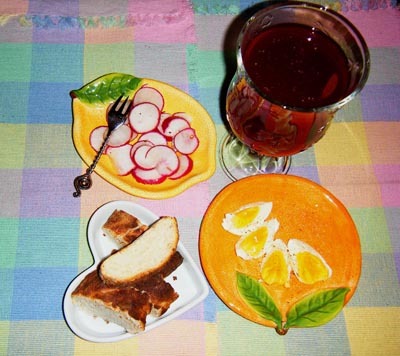 My light lunch will also have one hard-boiled egg and five – six radishes sliced, seasoned with salt, pepper and olive oil, 2 oz. of bread I made yesterday and a couple of oranges from my tree. Italian espresso coffee, a hand full of dry nuts and one piece of chocolate will follow about thirty minutes later. Notice the plates in my photograph? They are appetizers size plates, I can only fill them up to the rim, visually they look full and the brain already feels satisfied, but in reality the quantity of food is very small. Afterwards, when the food is gone, it will be so natural to have the sensation of a full stomach. In restaurants I have the same attitude towards portions. My question is always the same: “how big is the plate?” and if the waiter says it is a good portion, I select something smaller. Personally, I don’t like to leave the restaurant with a doggy bag in my hands, I only order what I can eat, but that is just my Italian upbringing. With this type of light lunch, you can allow yourself to eat more often during the day, enjoy small tasty meals and never get to the dinner table with the hunger stuck to your eyes.